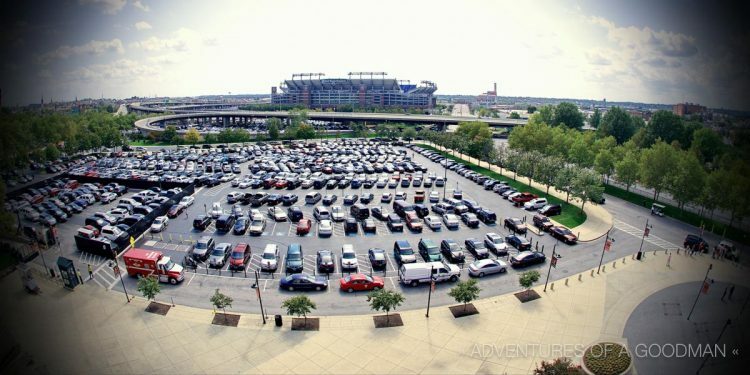 Located in the heart of downtown Baltimore, Camden Yards’ groundbreaking architecture and layout has influenced every new Major League Baseball stadium built in the last 20 years. When it opened in 1992, Camden Yards was the first throw-back “retro” stadium that paid homage to its historical forefathers. The outer walls are a beautiful red brick, which is flanked by an old warehouse building that towers over right field and the bleachers. It was on that brick warehouse facade that Cal Ripken Jr.’s legendary chase of the all-time consecutive games played record was tracked during the 1995 season. I still remember going to Camden during that season with my father and cheering on the Birds. When I moved to Washington, DC, for college in 1998, the Baltimore Orioles were the closest Major League Baseball team. 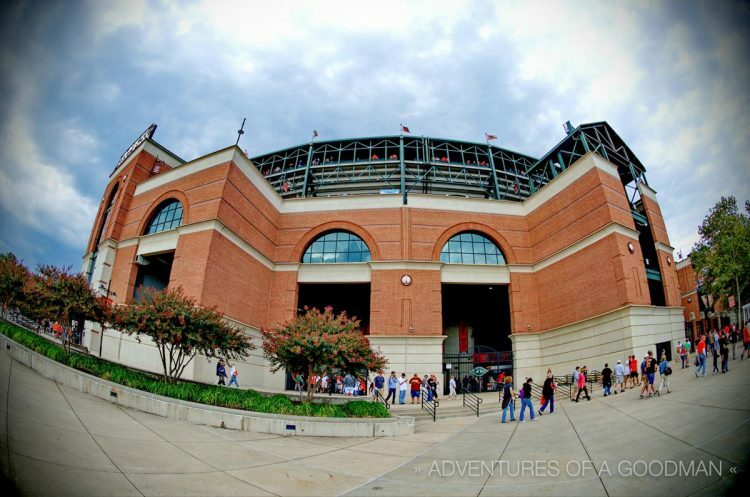 Although the O’s were never particularly good, I loved wandering around Camden Yards and taking in the beautiful architecture. In fact, if I had to choose an AL baseball team to compliment my beloved New York Mets, it would be the Orioles. For this reason, I’m especially excited about the renaissance the O’s experienced in 2012. After more than a decade of mediocrity, I was at Camden Yards on Sunday to watch them clinch their first postseason berth in 15 years. The Orioles Clinch a Playoff Spot! After spending the final weeks of the regular season going back and forth between first place and the wild card, the Orioles were playing for keeps during their final home game of the year. It was Sunday afternoon and Camden Yards was packed with cheering fans decked out in orange and black as the O’s mashed three home runs to beat the Boston Red Sox 6-3. It seemed that pretty much every time I found a good place to take a photograph, something happened in the game that caused the home crowd to thrust their hands up in celebration. Even today, 20 years after opening, Camden Yards remains one of the most beautiful stadiums in baseball. 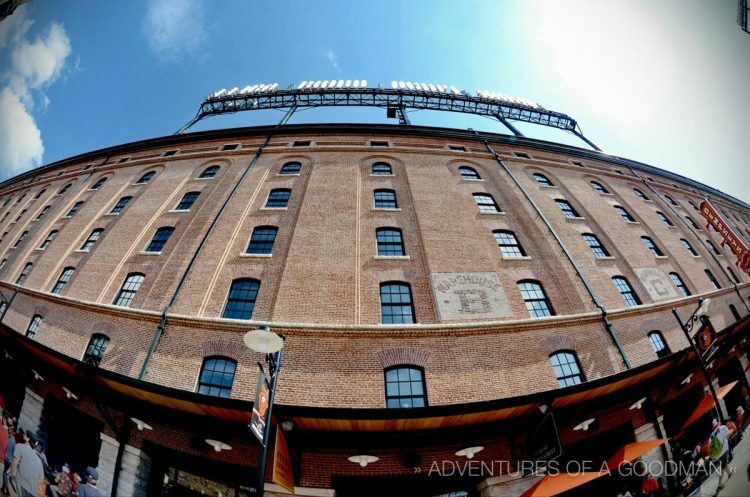 With it’s brick facade, statues, and other architectural flairs, the Baltimore Orioles do a wonderful job of paying homage to baseball’s history. The stadium itself is built on the old rail yard for the Baltimore and Ohio (B&O) Railroad’s Camden Station. 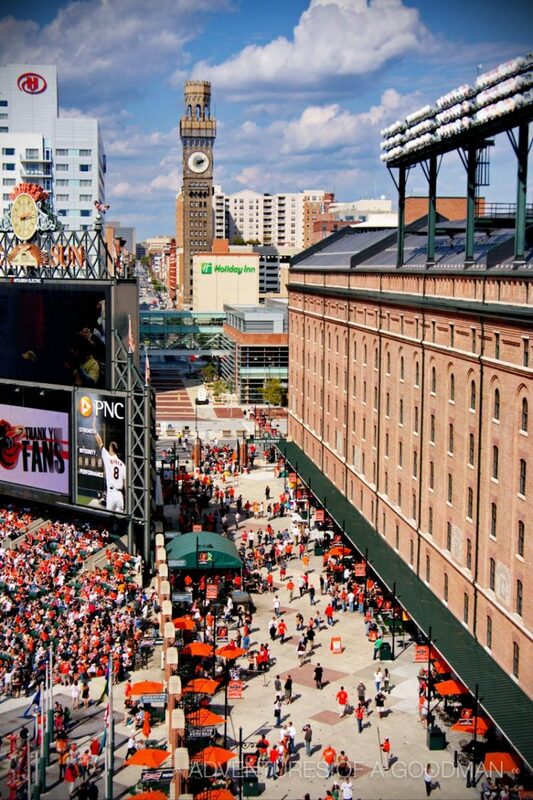 The massive brick building that towers above right field is the original B&O Warehouse, which runs parallel to the Eutaw Street promenade inside Camden. Most recently, the Orioles added a statue garden in the picnic area behind center field. 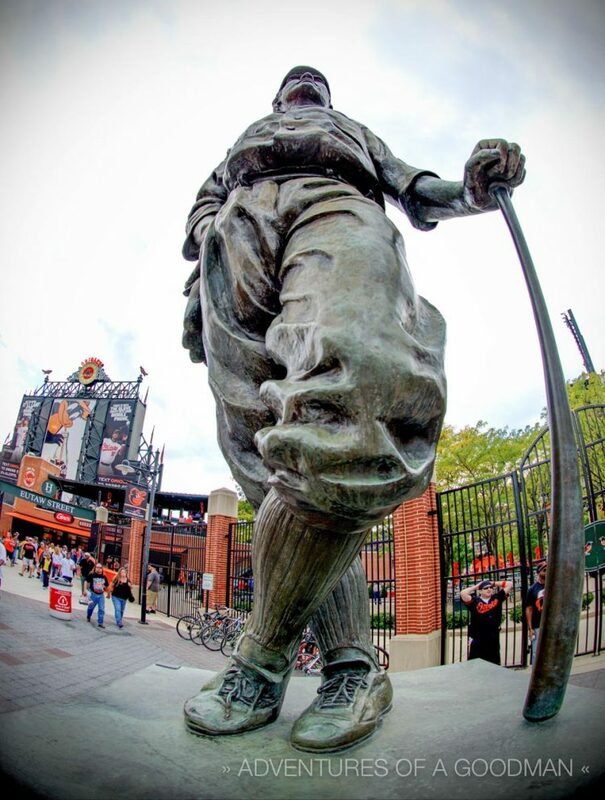 Paying homage to six of the Baltimore’s most famous players, they are a classy compliment to the statue of Babe Ruth, which has been outside Camden Yards since 1996. The stadium is the first major league ballpark to have an outfield wall made up entirely of straight wall segments since Ebbets Field. The playing field is 16 feet below street level. The stadium contains 4,631 club seats and 72 luxury suites. Every seat in the ballpark is green, except for two – these commemorate historic home runs by Cal Ripken Jr and Eddie Murray. You can watch the entire game from the bleachers behind the right field wall… like these Orioles fans below are doing. Congrats to the 2012 AL Wild Card Champion Baltimore Orioles!!! Final update: after an amazing run, the Baltimore Orioles defeated the Texas Rangers in a one game playoff; but eventually lost to the New York Yankees in a dramatic five game ALDS.